I found SunWarrior at Whole Foods the other day, and I thought, what even is that stuff? I didn’t recognize it as a protein supplement at all because of the unnatural look. I do like unnatural-looking stuff though, so I meandered over and grabbed one of the tubs. I don’t know what my first impression was…I guess I was just confused. This protein powder is totally unorthodox looking. Why don’t we actually start with the packaging review because that’s what you notice FIRST about Sunwarrior Warrior Blend Raw Vegan Protein. While my initial reaction was that of confusion, once I realized what this stuff actually was/is, I have gained a real appreciation of it. The jar itself is a big square, which you don’t expect from a protein powder. These products are almost always packaged in big wide cylindrical tubs. But not Sunwarrior. Nope. We are going to go against the grain, they said. And they certainly have. The square jar gives it a totally distinct look, that is further differentiated by the photo-realistic graphics on the front of the label. Look at me with my big words! Lol. The main graphic is a sky and could graphic that almost makes it looks like salad dressing, LOL. Actually you know what? I’ve seen this sort of label before…where was it?? Ohh I know! It was on FItTea. A product that I didn’t really like at all. Well. I don’t like ANY of those TeaTox products. But let’s get back to this protein packaging. The sunny and cloudy sky is the perfect backdrop to frame the lovely, text-based designs that sit in front of it. The fonts used for ‘WARRIOR BLEND’ and ‘vanilla’ are literally perfection. Another wonderful design element is/are the list of fun little icons along the bottom that tell you that it’s gluten-free, raw, soy free, and dairy free. It’s all great. I give them an ‘A’ on packaging. The taste? Not quite so much. So, I’ve had about 5 SunWarrior Warrior Blend shakes now, and what started as something that quite frankly I didn’t like at all, has sort of grown on me. I have the vanilla flavor, and the thing that threw me off at first was that it actually didn’t taste like vanilla at all at first. It didn’t taste bad at all, don’t get me wrong, but it really wasn’t a vanilla taste in my opinion. It’s sweet, but it’s not what you expect from a vanilla flavor. I think I was picking up some notes of citrus, and certainly some spiced flavors. I think a more appropriate name for this protein flavor would be something like ‘vanilla spice’ or ‘vanilla chai’, because when you do first try it, you can tell it’s not just another standard vanilla flavor. But once you get used to the way this protein tastes, it’s actually super enjoyable, so I’ll give it a ‘B’ on the flavoring. EDIT: I actually had the opportunity to try the chocolate flavor of this protein powder and I think it came out super well. I don’t know that it’s the BEST rendition of chocolate protein powder that I’ve ever tried, but it’s much better than many of them. 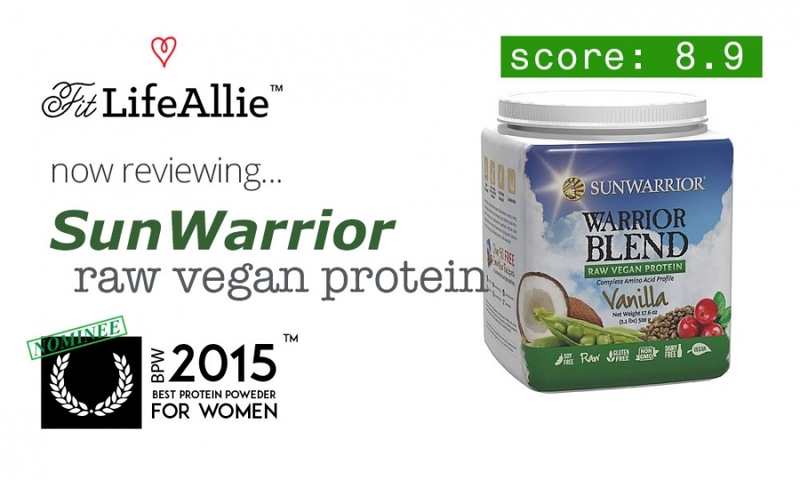 If I had to choose between the chocolate and vanilla Sunwarrior Warrior Blend Raw Vegan Protein, I would go with chocolate, unless you really like that sort of ‘spiced’ flavor profile. Hopefully that helps. Let’s look at the ingredient profile now. I’ve been doing a pretty good job breaking down these Vegan protein formulas by now. There are several things I enjoy about a good Vegan protein, not the least of which is the ability to digest it. I’m starting to build up a slight lactose intolerance, which has taken many of my favorite proteins off the market. But I’m starting to realize that some Vegan proteins are actually super hard to digest as well. The Vega Sport Protein that I reviewed earlier in the week for example, disagrees with my stomach very much. I was curious to see if this one did the same thing. That’s not such a bad ingredient profile at all. I think from a sodium standpoint, this protein is on the high side (320mg), and I also wouldn’t mind seeing them add about four more grams of protein to each serving to get up over 20 (currently 19g per serving), but then again you can just add another half scoop to get to where you like to be in terms of grams of protein. The overall calorie count of 100 is pretty great though. I’ll give the protein a middle of the road ‘B’. It could improve but it’s adequate, if not slightly above average.